What is the Visitors Flow Report? Visitors Flow is a graphical representation of the paths users took through your site, from the source, through the various pages, and where along their paths they exited your site. A node represents: one value of the dimension by which you’re filtering the visualization (first column); or a single page or collection of pages (for example, all pages in the wearables directory). A connection represents the path from one node to another, and the volume of traffic along that path. The Visitors Flow view provides a graphical representation of visitors’ flow through the site by traffic source (or any other dimensions) so you can see their journey, as well as where they dropped off. You’ll find this visualizer on the left hand navigation menu, where you’ll see a new “Visitors Flow” link under the Visitors section. Nodes are automatically clustered according to an intelligence algorithm that groups together the most likely visitor flow through a site. A useful feature of the Social report is being able to visualise the exact flow of visitors through your website from their original social source. Starting with the social network on the left, it provides a flowchart showing where audiences clicked next and whether or not they dropped the site entirely. 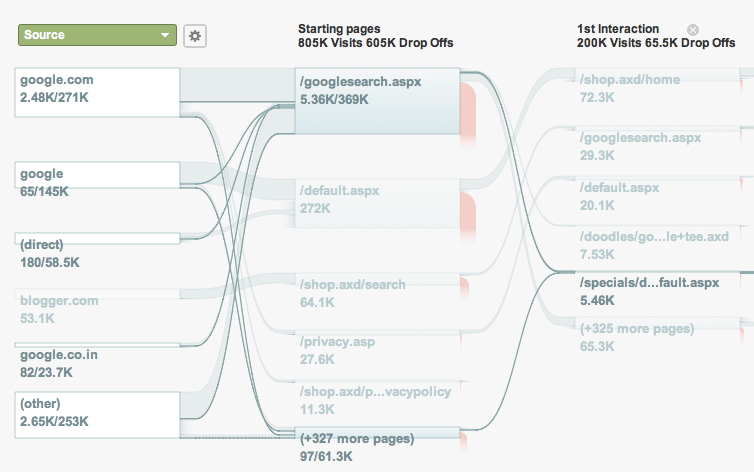 You can use this to identify how your website is being viewed and make adjustments to the visibility of certain links. In particular it will show whether or not visitors arriving via social media are finding their needs met on the first few pages they come to. 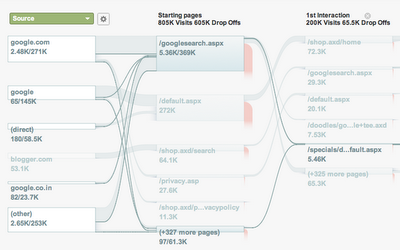 I'll try to use this tool, Visitor Flow. 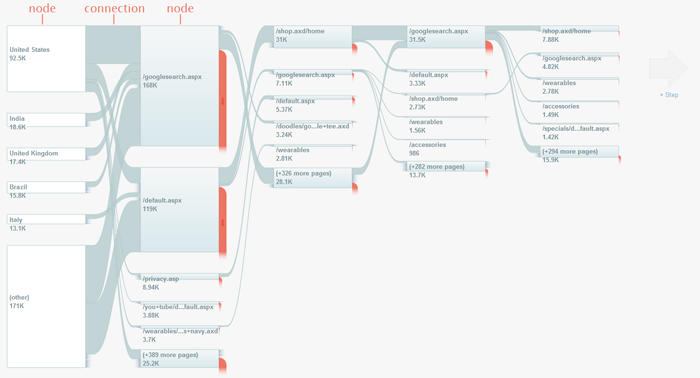 This will give me a representation of visitors' flow through the site by traffic source. I'll recommend this one as well to my friends. This might be useful. For more info, check ClickMinded.